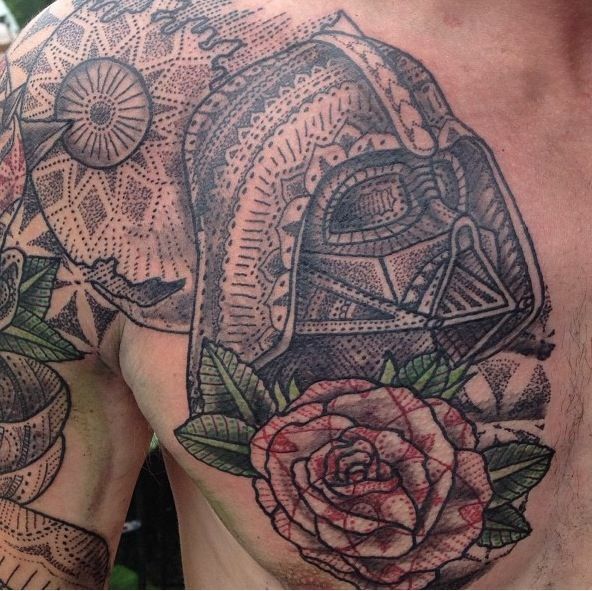 Star Wars Tattoos For Men are the answer! 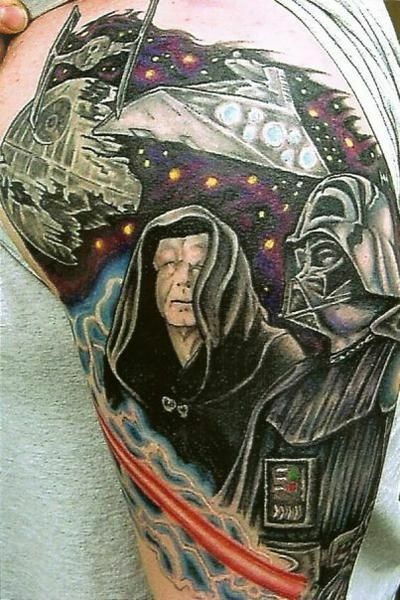 Everyone knows and loves Star Wars. The only people who do not love Star Wars are the people who have not seen it. It revolutionized how we think about cinema and it has changed multiple generations forever. Its characters are memorable, its story is fun and dark and the action sequences will never be forgotten. In addition, because there is so much to love, there is so much choice. 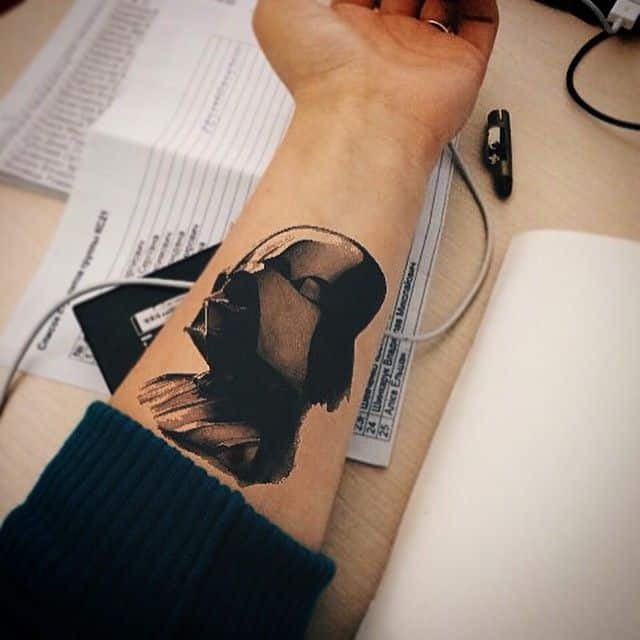 What better to give you inspiration for your first or next tattoo? 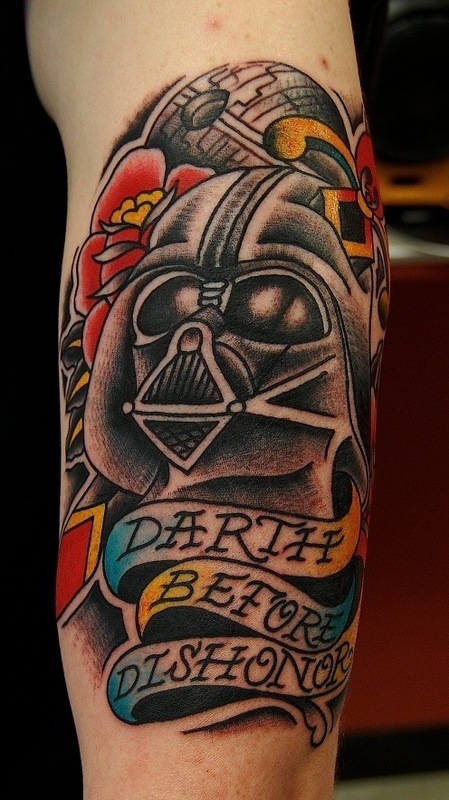 What sort of Star Wars tattoo should you choose? 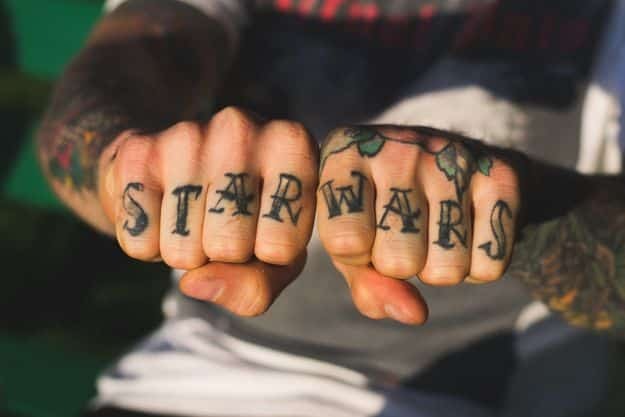 Once you have decided that you want to invest in a Star Wars tattoo, the next question is: what exactly should you get? 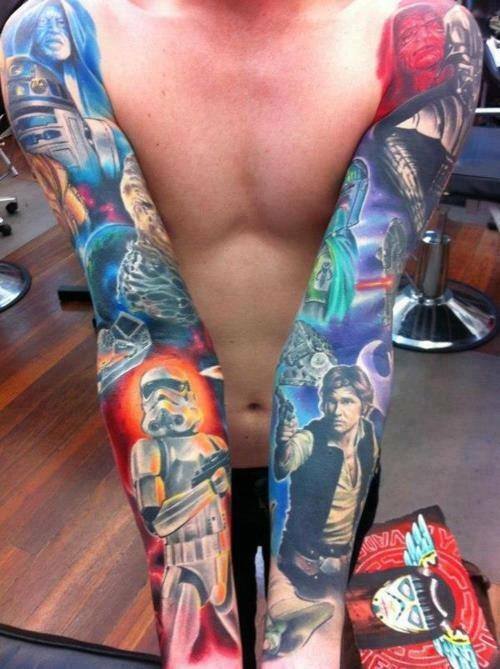 You may have seen other men with Star Wars tattoos. Darth Vader is a very popular choice, as is Han Solo (the epitome of masculinity). Getting a picture of your favorite character, therefore, is a great choice, although perhaps an obvious one. If you want to stand out a little more, however, you might want to consider getting something that you have not seen before. Perhaps getting one of the lesser known characters – perhaps Wedge Antilles, considered possibly one of the coolest characters in the entire universe, and essential to the plot that eventually overthrew Vader – is a better idea. What about some of the ships or weapons that were used? They have timeless designs that everyone will recognize and love instantly. 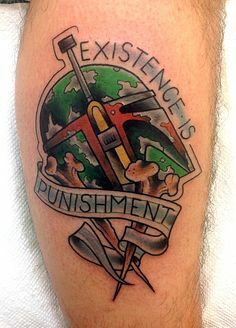 Try to think a little outside the box and perhaps combine scenes, characters and props to make your own little part of the extended universe, capturing it forever in tattoo form. 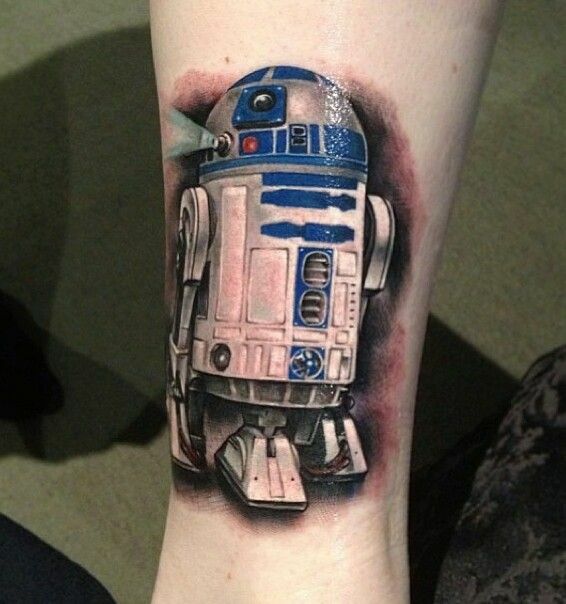 Why get a Star Wars tattoo if you are a man? 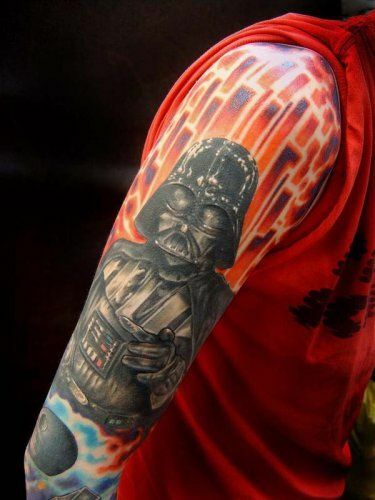 If you are a man and you are looking for the perfect tattoo, Star Wars is the right choice for you. 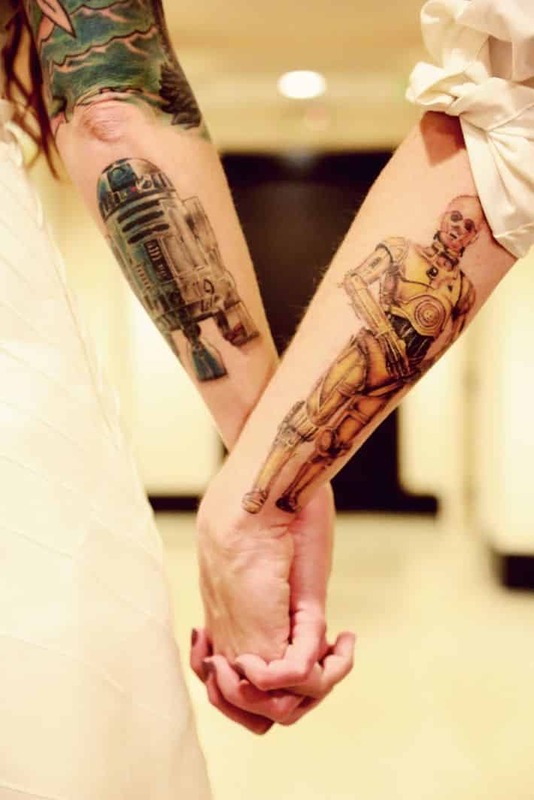 You will find that a lot of other men have had the same idea – a lot of men are interested in Star Wars, and who wouldn’t be? It’s awesome! – which means that you are in good company. 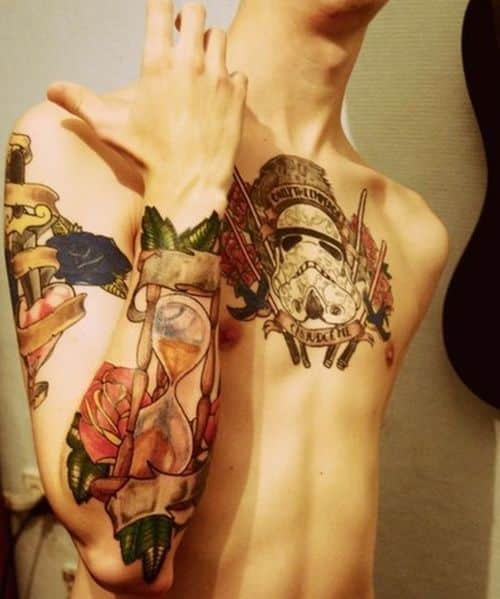 It also does not make it look as though you are trying too hard to look masculine, like it might if you went for one of the more typical “bad boy” tattoos which, let’s face it, make you look not such much a hard “man” as a bad “boy”. 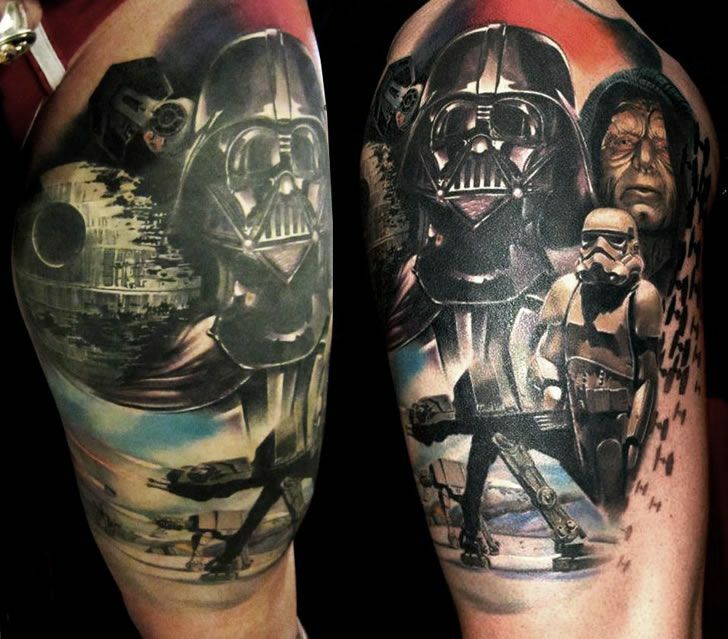 The iconic battle between Obi-Wan Kenobi and Darth Vader is displayed in this star wars tattoo sleeve. Destruction lurks within the galaxy as seen in the background, rocks, flames, weapons floating in space, giving off a rightful ambiance of the epic combat. 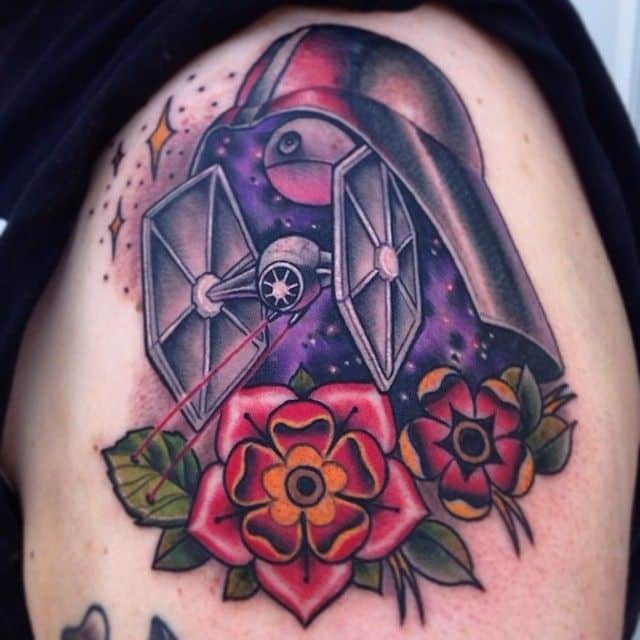 A meaningful tattoo that illustrates Darth Vader with his head up high, backed up with a humongous empire weapon yet laden with flowers to keep the memory of Amidala whom he wished to save, and embedded with short words whose message goes a long way. Space is elegantly painted in black and white, a complement to Darth Vader’s vividly black suit. His dark leadership is undoubtedly seen with Boba Fett marching off and the stormtroopers. Tie Fighters, the Millenium Falcon, and the Death Star are also present. The intensity of madness is felt with a ripped off appearance of the Sith Lord’s mask, which reveals a skull rather than the face of the supposedly Chosen One, Anakin, who apparently chose the Dark Side. The glowing red Death Ship may be releasing the steam that caused the suit to meltdown. Darth Vader displays supremacy with his upper half body manifested together with the Death Star. The Sith Lord is pointing right at foes, scorching in a way that no challenger would dare get near you, for they must bow down or be destroyed! 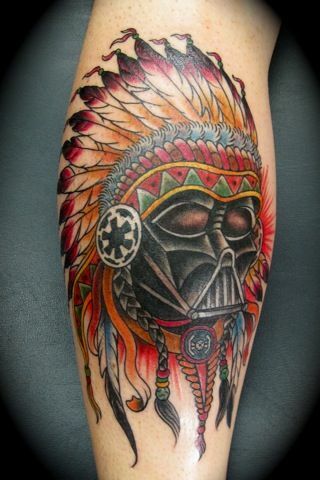 The powerful Darth Vader and a faceless stormtrooper under his command are set in a most graceful and fashionable form on the leg. Covering from right below the knee to near close to the feet, this a pristine creation which possesses beauty that cannot be highlighted more. Anakin’s betrayal of the Jedi is explicitly showed in the blackness of Darth Vader’s mask. The impeccably polished helmet set upon his head brilliantly shows off. The front defines his facial features in great detail, as if embossed that you can almost touch it. 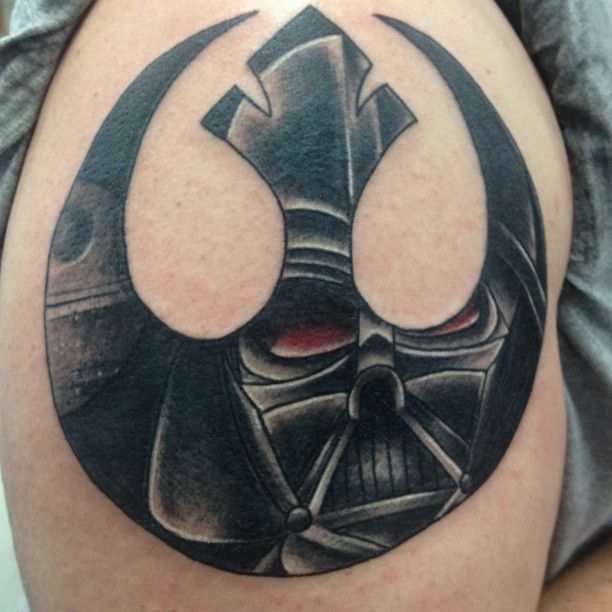 The symbol of the new republic era is magnified to reflect the image of the Dark Lord – Darth Vader. His eyes are red and fully expresses anger. Wrath could be unleashed anytime soon, as you get a glimpse of the Death Ship that can wreak chaos and destruction in seconds. Darth Vader in brilliant black, and the Death Star Ship Planet Destroyer created by the Sith Lord himself together makes a perfect scene. The Sith Lord against a starry night of the galaxy far and wide produces an astounding backdrop. Young Anakin Skywalker, a boy full of promise and a had a bright future in the star wars universe, holding a reputation of being able to repair anything, build things even from scratch, and program droids. Who knew he would actually end up with the Dark Side and use his talent towards destruction? Both sides are exquisitely shown in this two-faced tattoo. 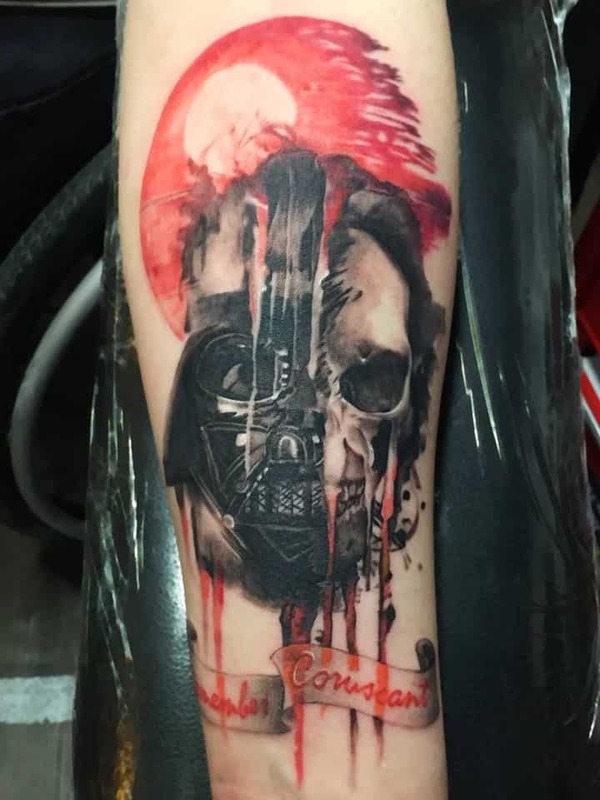 An ink-blotted look of the Sith Lord is quintessential in representing the star wars theme. 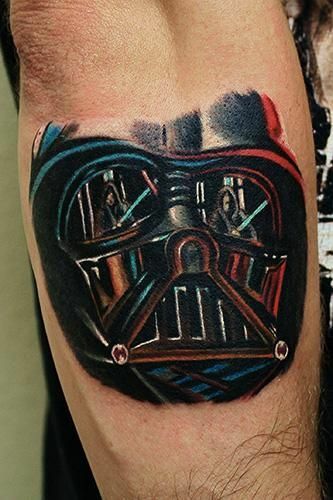 The face of Darth Vader and his armor are still quite evident, laid in fine red lines stimulating modern technology, this style showcases a truly remarkable arm tattoo. 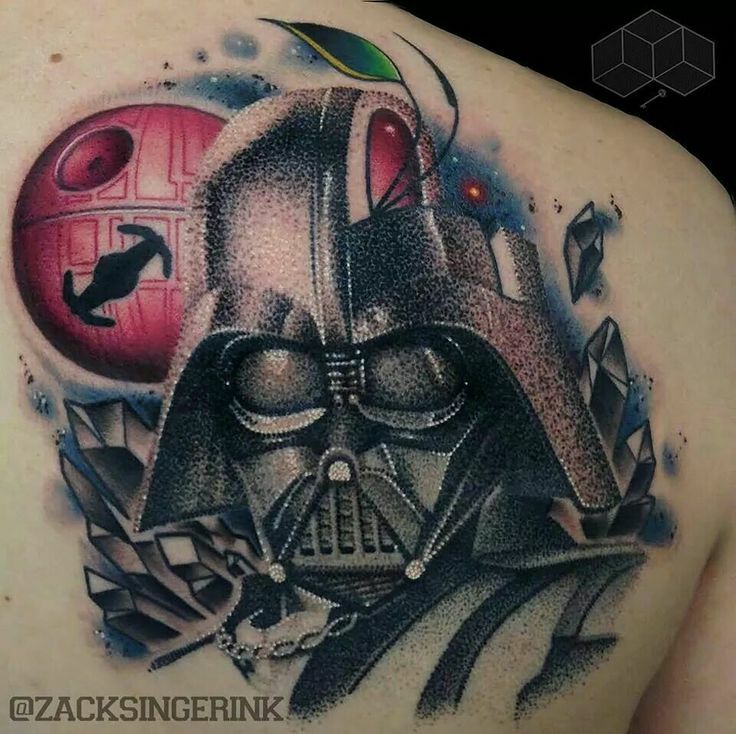 A traditional star wars tattoo, this style displays the silhouette of the Dark Lord of the Sith, or known as Darth Vader for Short. 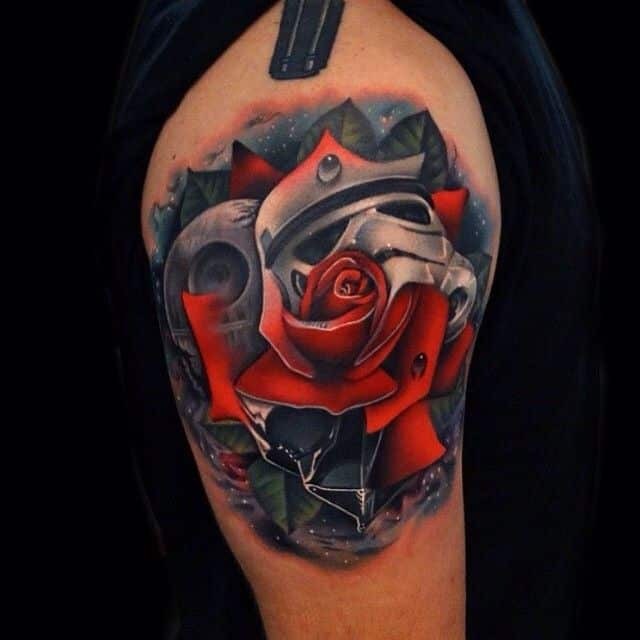 It is laid with the finest details and shades on the perfect spot, right on the forearm. 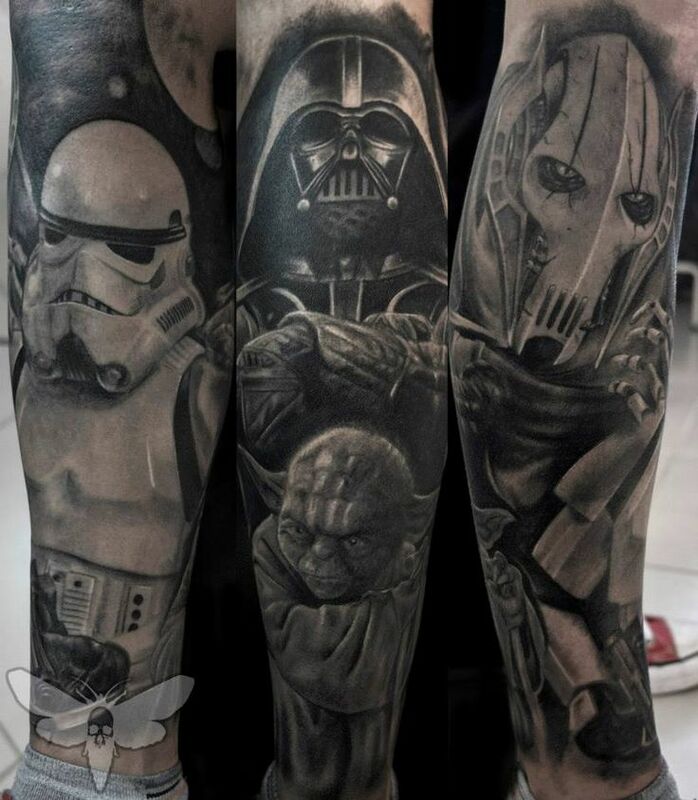 Both a classical and modern depiction of star wars tattoos, the bright beams of sharp light sabers shine through to striking beauty. Boba Fett battles side by side with Darth Vader, with Palpatine, definitely sublime supremacy. 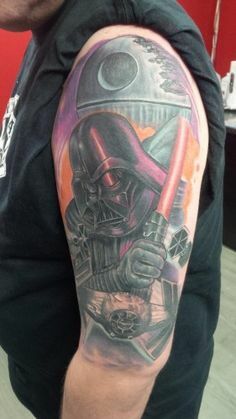 Which character among star wars tattoo ideas would show utmost power, betrayal, darkness, and just utterly twisted and evil? 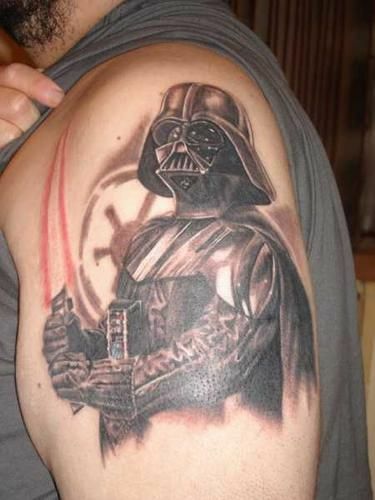 No other than Darth Vader, from Jedi to Sith Lord. His burnt body and immense self-hatred seems to radiate in his armor. The helmet the Sith Lord wears exudes intimidation and empowerment. 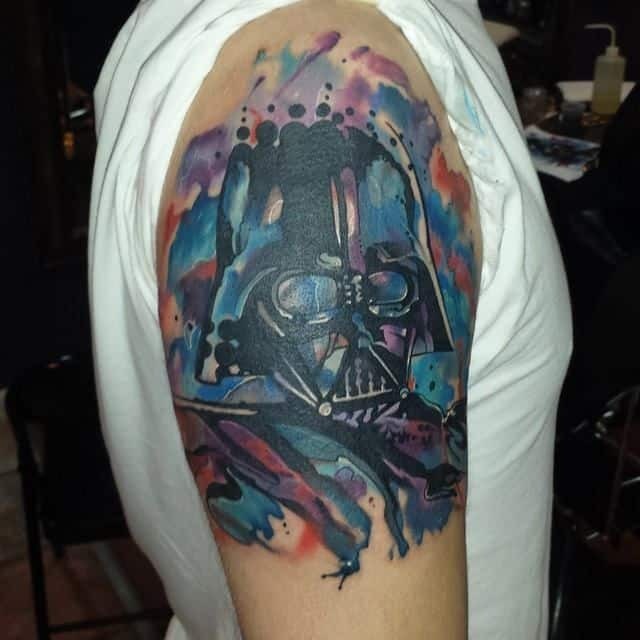 This unique pick out of the various star wars tattoo designs imbues colors, which can be considered an artful display of mixed emotions that led to him to the dark side. 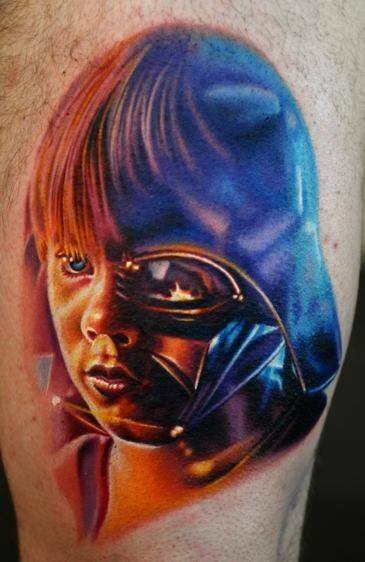 A portion of Darth Vader’s mask which outlines his face is presented in an artistically modern way in this tattoo. All attributes are carved in great depth, then colors and texture have been added to enhance it even more, more so, the image of a Jedi to eradicate as his main focus. Darth Vader appears towering high and quite powerful. His full suit, serial number: E-3778Q-1 is revealed. This armor is bestowed in Sith alchemy and together with the light saber powered by crimson synth-crystal, renders him invulnerable. 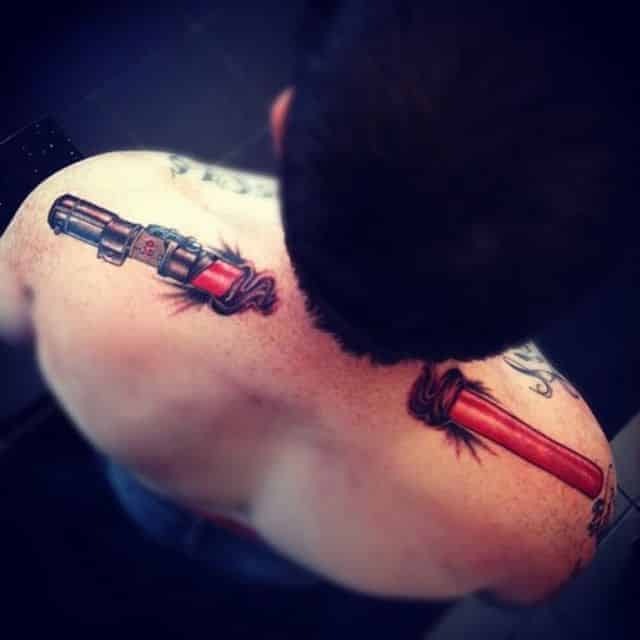 One of the awesome star wars tattoos to proudly display- Darth Vader in his lustrous, solid black armor designed to encase his burnt body after his duel with Obi-Wan Kenobi, yet the fire of his wrath is seen in blazing red flames! What led Anakin Skywalker to the Dark Side? Nothing else but his love for Padme, to save her from inevitable death. Let this rose symbolize her unfaltering beauty with each petal and leaf intricately detailed, right beside Darth Vader, where Anakin now lies beneath in self-hatred. 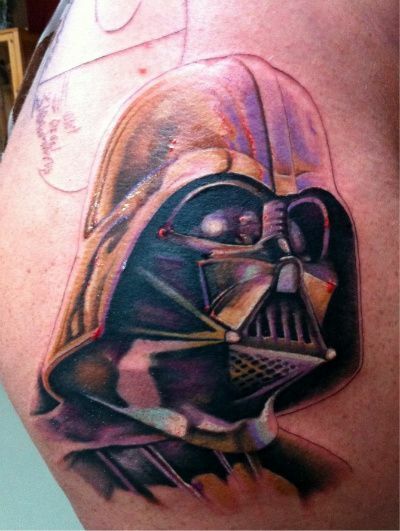 Feel the power of Darth Vader alongside his Death Star Space Station or his Emperor Palpatine. Walk like an elite stormtrooper and show off absolute strength along with the AT-AT walker, or the All Terrain Armored Transport used by the Imperial ground forces. Stand high and proud with this combat vehicle’s tremendous armor and colossal size of about 20 meters tall! 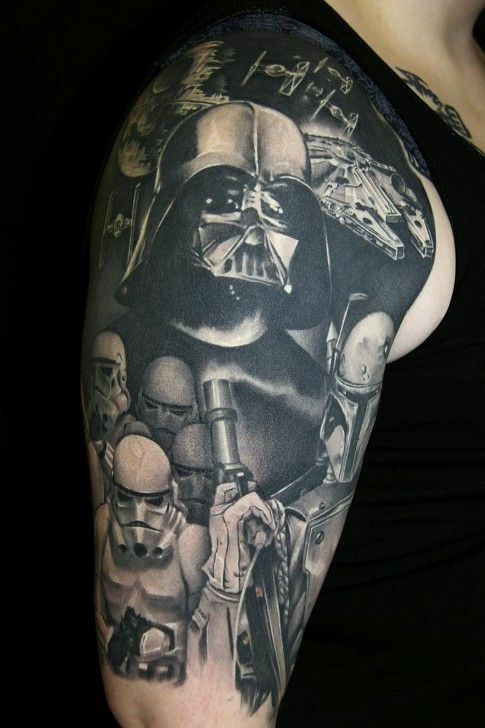 Darth Vader is dotted carefully in this image among cool star wars tattoos. Gemstones float around in the galaxy, which are mineral resources utilized for the construction of armor and weapons. The Empire’s ultimate weapon, the Death Star, is ready to blast its laserpower that can turn anything to nothingness! 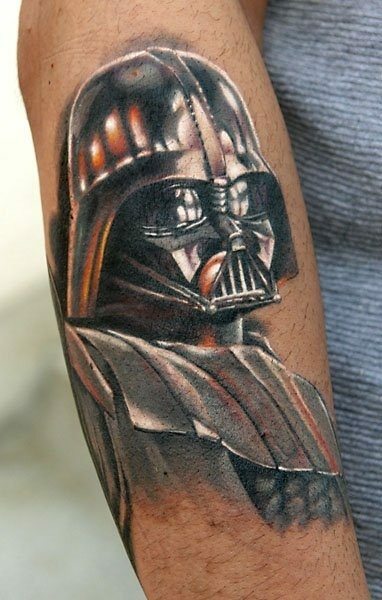 The Rebellion era icon serves as the backdrop of this tattoo showing the Sith Lord ready to strike. He holds the lightsaber he used to kill Obi-Wan Kenobi and to cut off the hands of Luke Skywalker, his very own son. 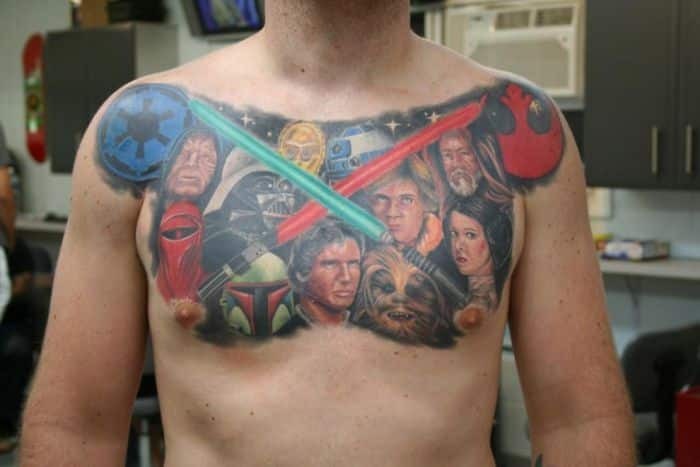 A ravishing body tattoo that portrays the star wars timeless characters and awesome scenes. From the Dark Lord’s rise, Darth Vader remains the center, surrounded by stormtroopers, the Death Star, various Empire weapons and robots, chewbacca and other creatures, and the royal highnesses. A one-of-a-kind twist in Darth Vader’s plain black appearances, the Sith Lord wears a feathered war headdress. Each feather is delicately drawn, where the Rebellion era icon pinned to the bonnet. 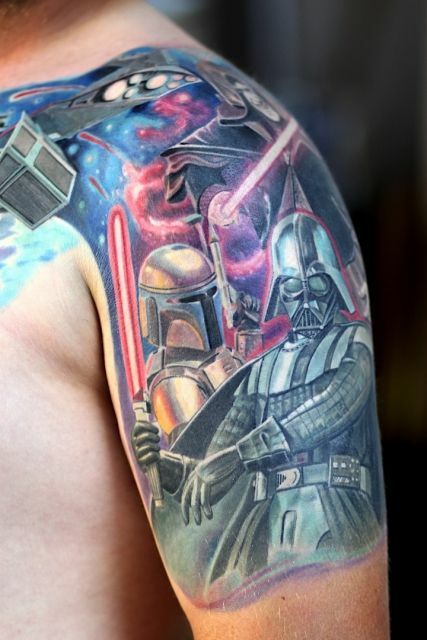 It symbolizes the star wars battles and the great stories to tell that come with it. The touch of colors infused in this image of Darth Vader delivers a masterpiece, which would look great wherever you place it. 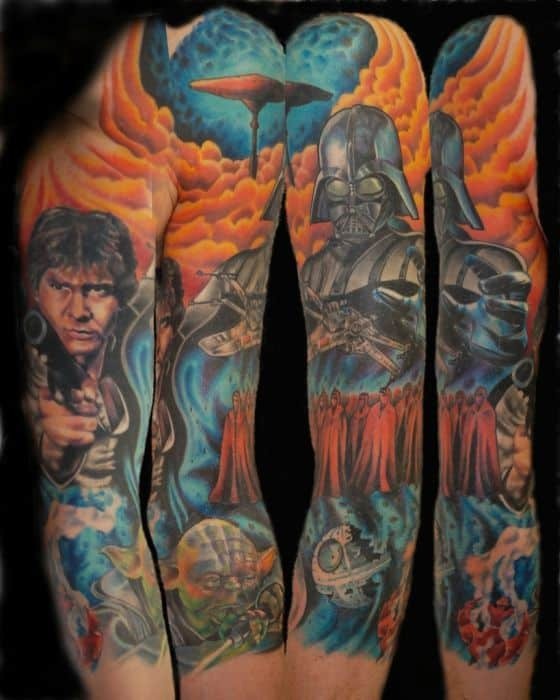 Enhance your body with a work of art such as this star wars sleeve, forearm or chest tattoo, or anywhere you deem the Dark Side must rest upon. 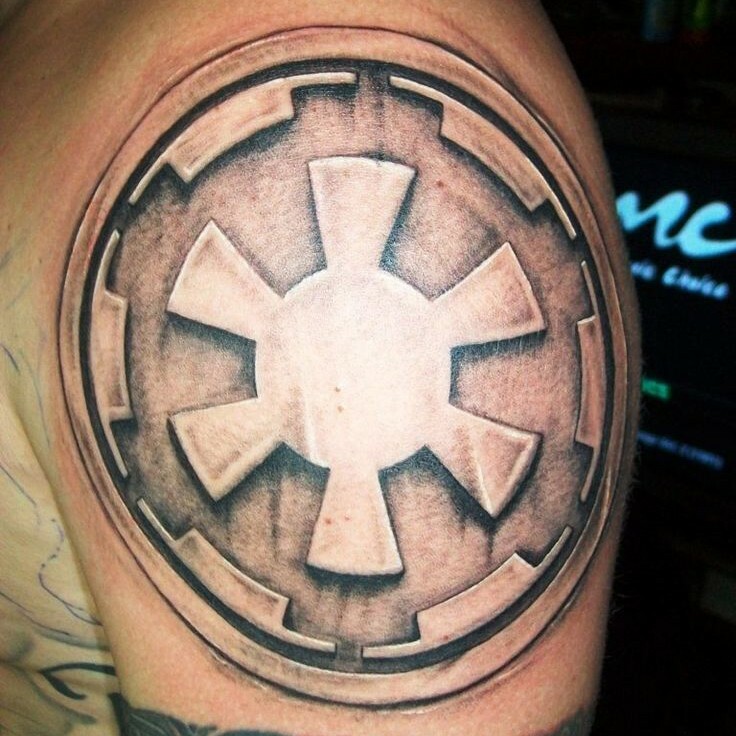 The Sith Lord and the Death Star illustrated in this emblem generates quite an impressive effect. 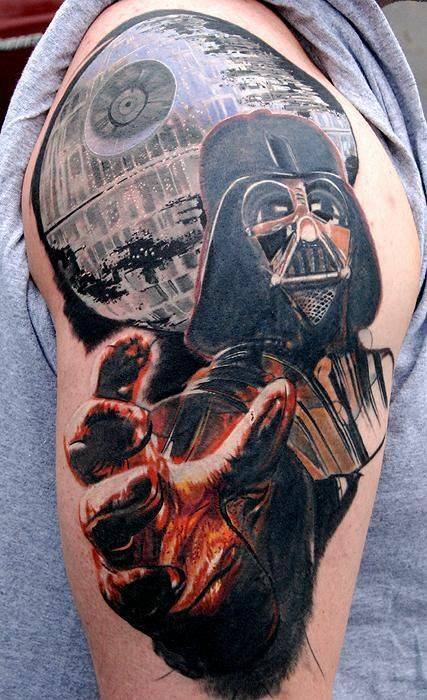 Topped with Darth Vader’s fiery hand extending outwards from the tattoo itself, almost like saying- Join us or Die, this surely falls under the most awesome star wars tattoos! 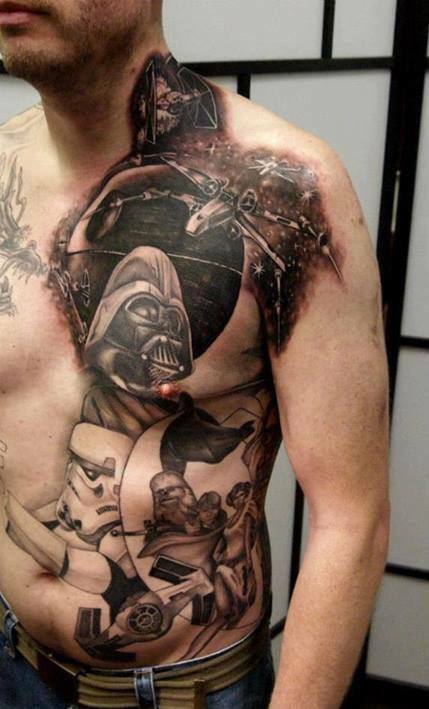 An exemplary work of art, this tattoo holds the moon-like yet gargantuan Death Star battlestation. The TIE Fighter and Star Destroyer are seen navigating the galaxies under the command of Darth Vader with his lightsaber in hand, during Palpatine’s New Order. Darth Vader wields the lightsaber he crafted himself and uses for the rest of his Sith Lord days, the elegant weapon of the civilized age. It is turned on and beaming with its red-hued blade, mirrored on his mask, with the Imperial planet-destroyer Death Star and an eyeball of the TIE Fighter as part of the setting. 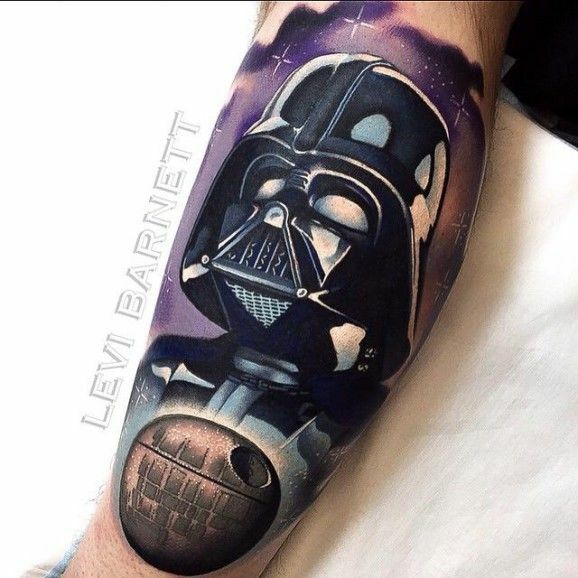 A diverse tattoo which gives off a contemporary look perfect that’s suitable for the modern, fast paced lifestyle or a classical look for a traditional star wars tattoo image. The stormtrooper comes in textured gray, neat and detailed in its overall appearance. An extension of the Emperor’s forceful hand, a stormtrooper displays absolute power. 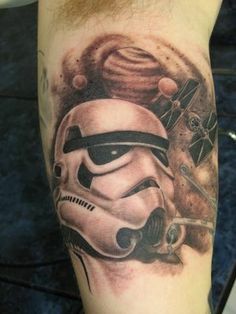 This elite soldier is a symbol of major authority towering over thousands of star systems, which is fully described in this tattoo wherein a stormtrooper is kept within a classy, oval frame. Much like Imperial l-class star destroyers and TIE fighters, stormtroopers are heavily built, strong and forceful. 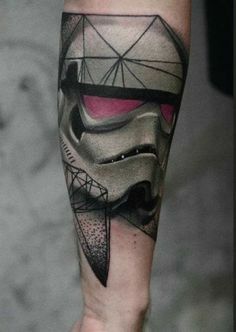 The faceless enforcers of the New Order amidst a backdrop of the galaxy, the planets enveloped in dust, and a TIE fighter yields a beautiful tattoo. 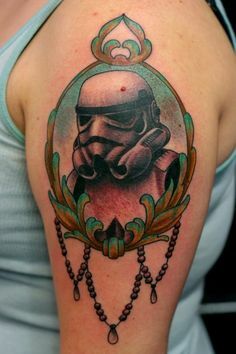 A chest tattoo that defines the Rebellion Era with an ornate image of a stormtrooper delicately filled with scanty, curvy lines. Lightsabers and roses throng the background. The tattoo skit perfectly matches the sand timer resting upon the arm’s length, which is wrapped in roses as well. 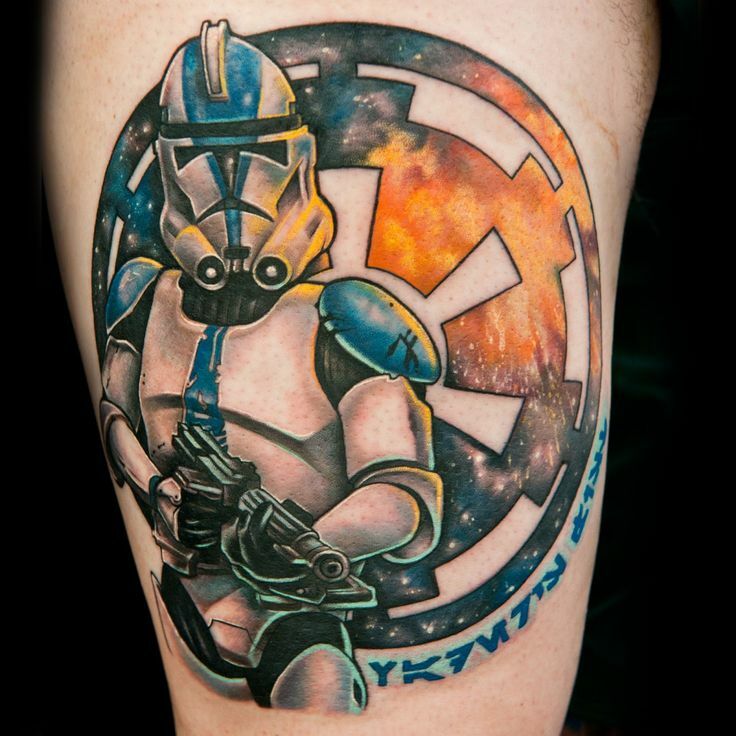 The stormtrooper in solid white, dabbed with light hues of blue, is highlighted by its decorative, colorful surroundings. 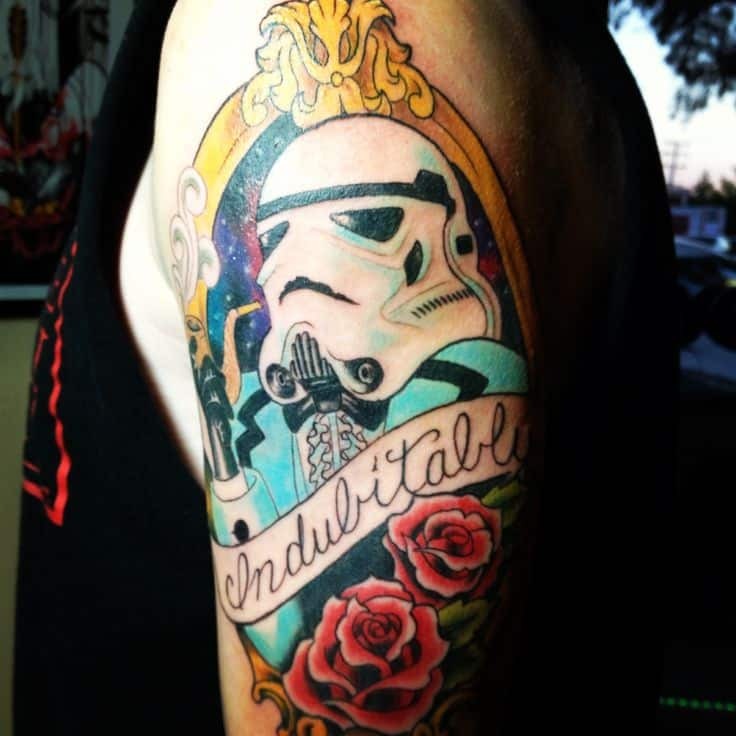 This star wars tattoo sleeve borders the upper arm in a round frame, with red roses to accentuate the entire theme right beneath the imperial soldier. 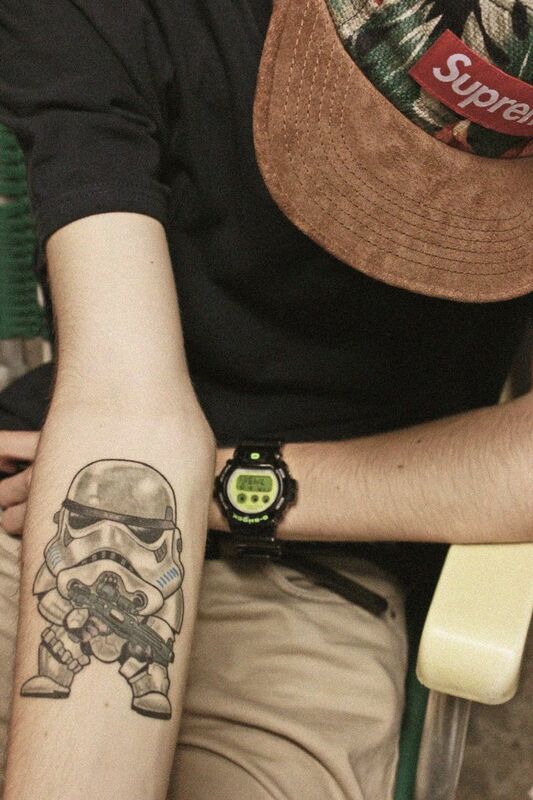 An outline of the buckethead, plastic soldier, whitehat, which the stormtrooper is otherwise known, is carefully printed very near the wrist. The simple picture perfectly adorns this part of the hand, and thin and thick lines define this remarkable tattoo. A fine picture of a stormtrooper which makes it seem like it was painted on canvas, the silhouette of the white soldier sketched in great detail. You can almost trace the armor’s unique form, with curves and lines perfectly blended together and enhanced with shades and shadows. A cool twist is incorporated in this style. 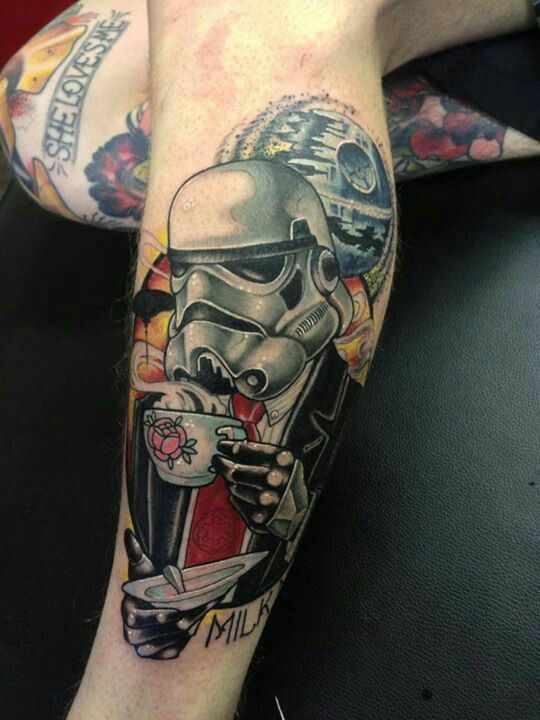 It’s not just the powerful stormtrooper and the extremely dangerous Death Star that makes this tattoo significant, but the elite soldier wearing a business suit and even relaxing with a rose-engraved hot cup. Would it be coffee, tea, or milk? Appearing almost like an abstract and a very noticeable and praiseworthy design, the stormtrooper rests side by side with the Death Star. Both are wrapped in the beauty of a vibrant red rose lined with leaves. The night filled with stars surely enhances the picture. White against an abstract and slurred paint of dark red and black shades, the unknown face of the stormtrooper looks just like what it exactly is- a main ground force of the Galactic Empire that leaves a big, brawny impression. Commemorate the death of Count Dooku, the death of General Grievous, and the massacre of the Confederacy of Independent Systems leaders on Mustafar, with the rosy red flowers in the backdrop. 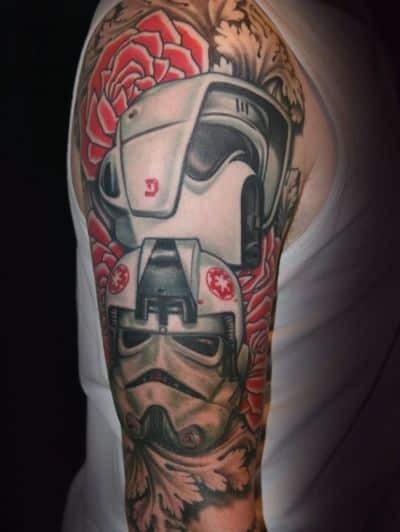 These battles led to the reorganization of the First Galactic Empire and the colossal authority of the stormtroopers, put on the spotlight on this sleeve tattoo. Whatever morphed Emperor Palpatine’s face, whether it was due to the force o lightning or he’s just plain old and evil, or maybe it is what he truly looked like in the first place, still remains a mystery. 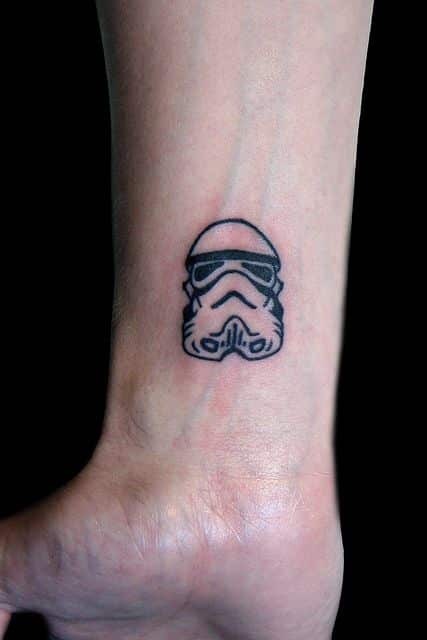 Likewise, the stormtrooper stays faceless and unknown, like the one that lies on this tattoo. This weapon-wielding soldier is destined to imbue the might of the Imperial Military during the reign of the Galactic Empire. Fearsome but both charming and enchanting, here’s the unaltered clone of the famous Jango Fett. Boba Fett is portrayed in his customized Mandalorian armor, then filled with texture and a touch of polished colors. Silently, he points his deadly weapon towards his bounty. 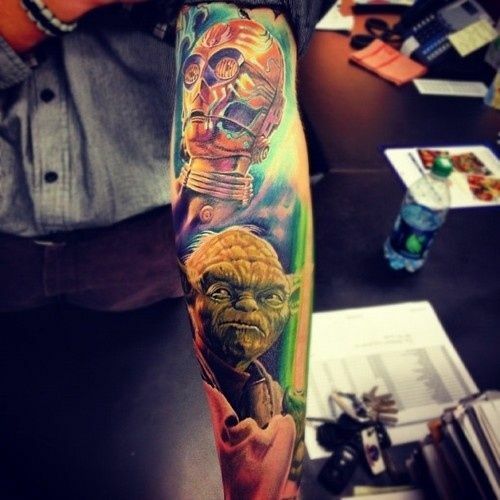 This star wars arm tattoo is bright and extremely attractive, which can be attributed to Yoda’s green lightsaber and his unfaltering wisdom. He comes together with an astounding creation, C-3PO. The humanoid protocol droid’s intelligence, luster and shine, and finely detailed form definitely enhances the scene. 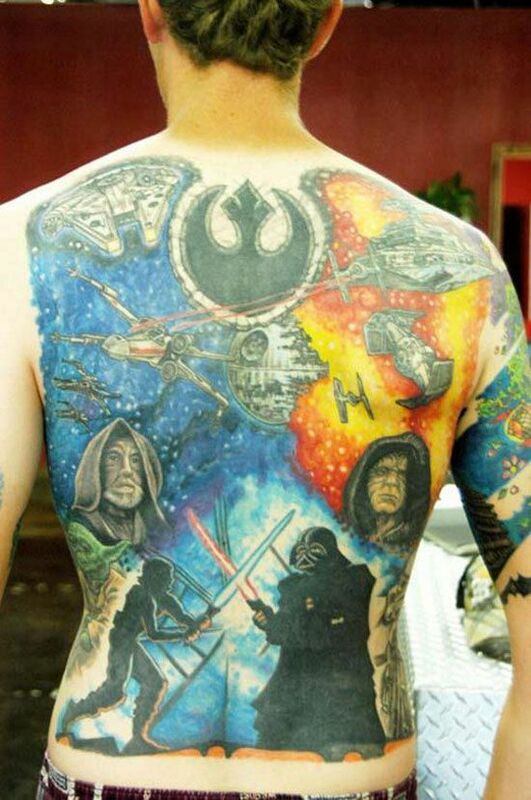 A complete masterpiece, this may be the best among star wars tattoo designs covering the entire back. The emblem of the New Republic Era is centered at the back, with a combat scene of Jedi and Sith Lords, divided between Obi-Wan and Palpatine. The Empire’s massive weapons are flying about at lightning speed, and their laser beams and explosions shatter the calm universe. Who would not fall for the miniature, resourceful astromech droid named R2-D2? This robot has served Amidala, Anakin and Luke, and has explicitly displayed unquestionable bravery in rescuing his friends and masters from grave danger. 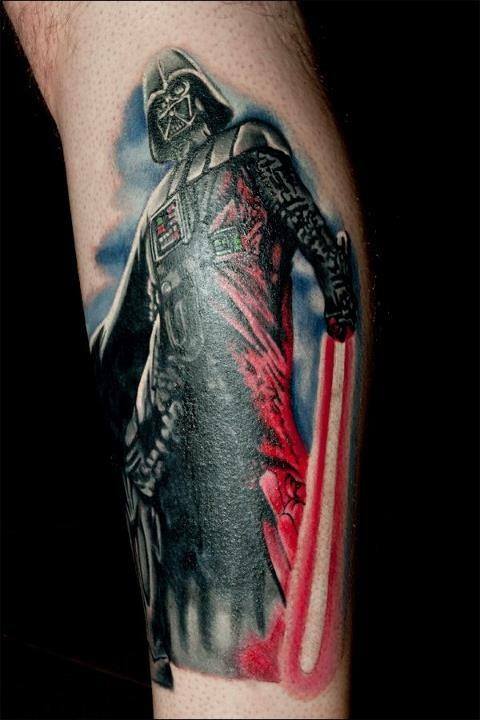 You can be his next master by having cool star wars tattoos such as this! Lightsaber crystals denote a Jedi’s chosen class, and come in various colors. Green indicates a Jedi Consular who preferred to fight the Dark Side and reflect on the Force and its mysteries, while Red, coming from synth-crystals, exhibits the negative energies of their creators. 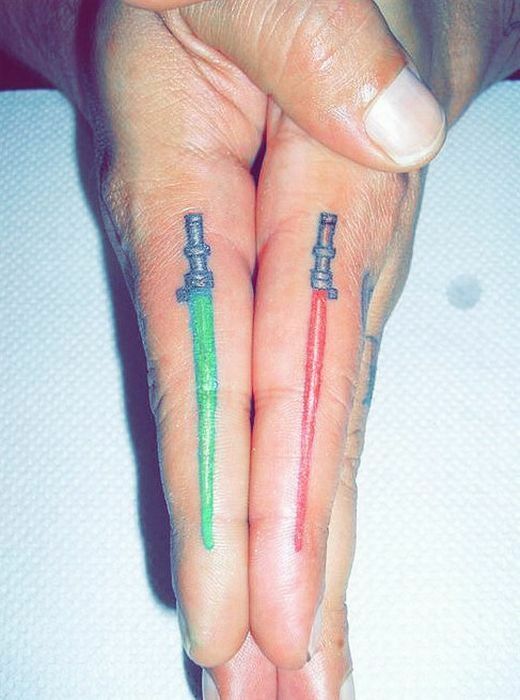 Green and Red lightsabers thinly outlined on the forefingers give a contrasting, sleek and pretty cool look. Cute little chewie is much more than how adorable he looks! Chewbacca is a legendary Wokkiee and Han Solo’s co-pilot. 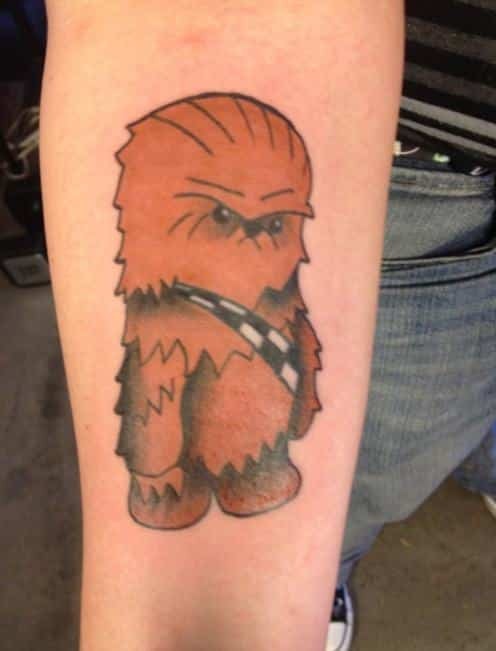 Wise, sophisticated, endowed with great strength and loyalty, this creature is among the greatest star wars tattoo ideas. 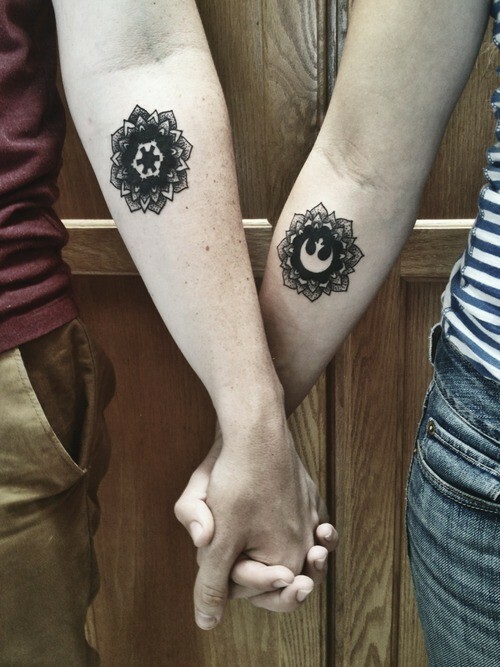 Simple yet elegant and no doubt, beautiful, each letter of STAR WARS perfectly fit the fingers of your hand. The letters are delicately written, and closed fists give the strong image of the entire empire, right in the palm of your hands! Honored as the Revan yet dreaded as the Dark Lord of the Sith Darth Revan, this man played both Jedi and Sith- possessing the qualities of a conqueror, savior, hero or villain. 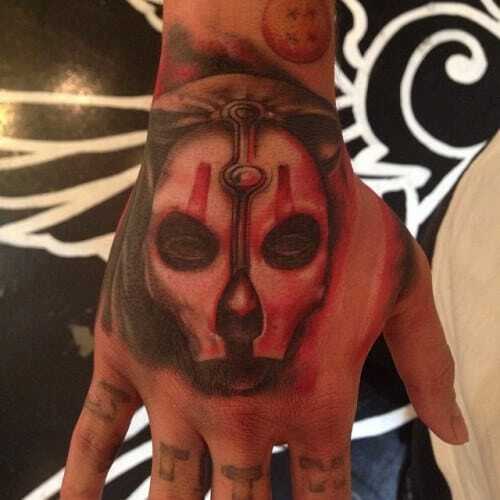 His mask renders a perfect star wars hand tattoo, where you are safe in not taking sides. 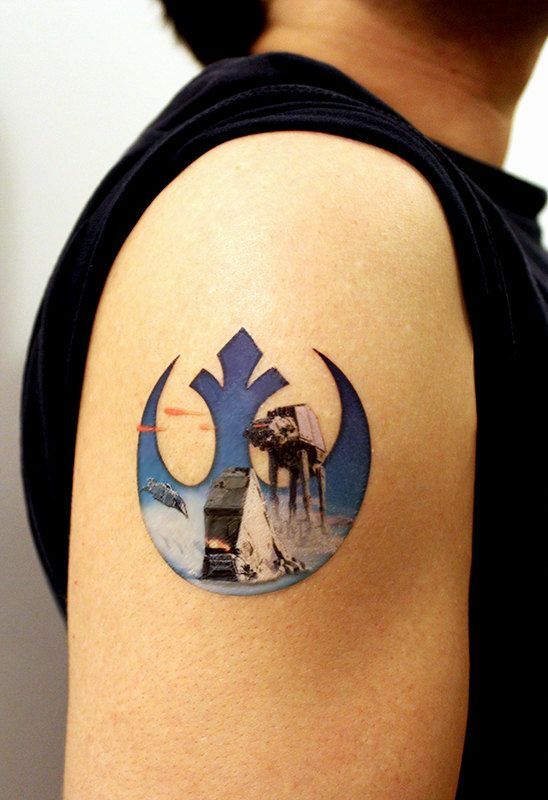 Two tattoos, symbolizing the Before the Republic Era, where you reminisce of Shae Koda, Tau, Daegen Lok, and more. Feel like the gregarious, brave and bold Sek’nos Rath, or Seki- known to be a ladies man! You can see the guy here holding hands with a lady laden with the insignia of the New Republic Era. 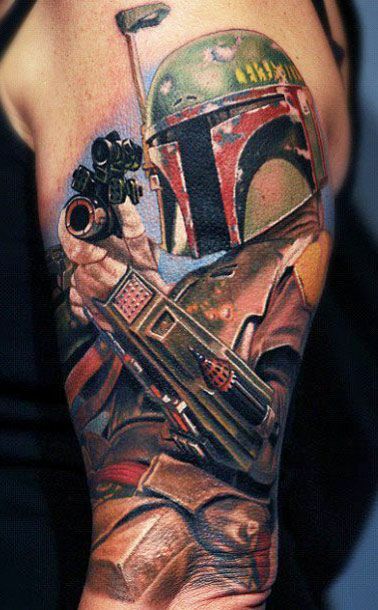 Boba Fett, drawn with the most delicate lines, dabbed with lustrous colors and all out ready to fight in battle- distinctive among star wars tattoos. 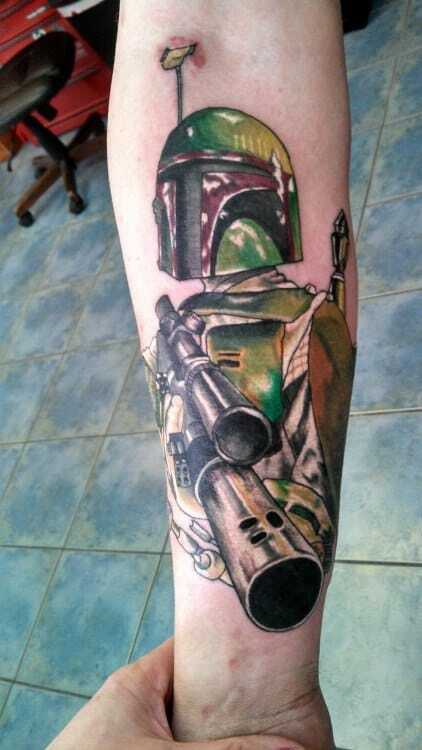 His weapon is amplified and therefore signifies his power of being the best bounty hunter in the entire galaxy. The two most famous robots from Star Wars, R2D2 and C3PO. The entire R2D2 is seen in the foreground, complete with red light on top and blue panels on the body. Above it is C3PO’s head in golden metalwith a planet in background. 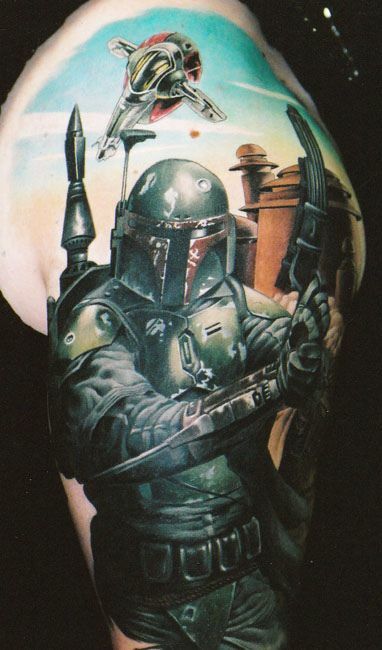 A great Star Wars tattoo for guys –which shows Bobba Fett the Bounty Hunter in his green amour with a Tattoine building behind him. Bobba has his weapon drawn and his holding it pointing at the sky with both hands. 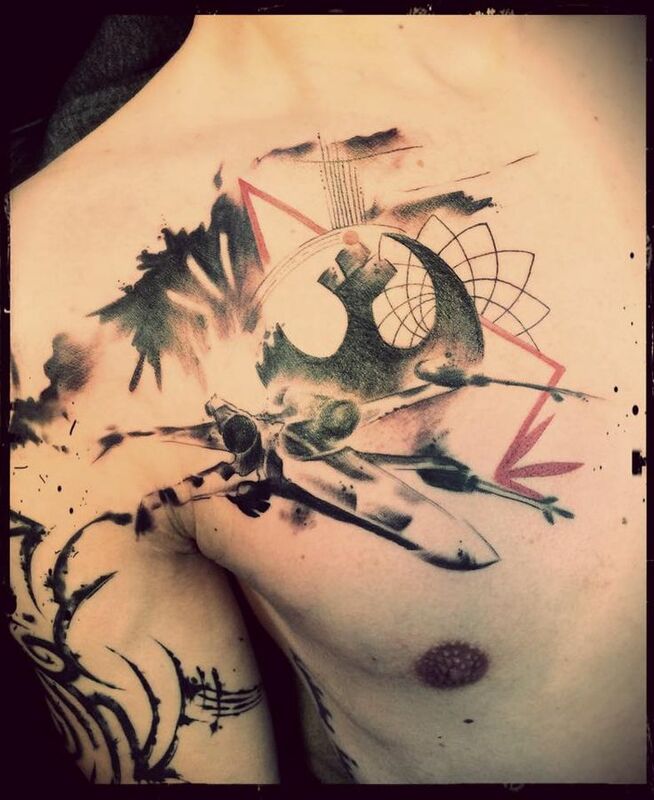 At the top of this tattoo is the Millennium Falcon, piloted by Hans Solo and Chewbacca as it flies overhead. Yoda who stands in the foreground. Between them is Jabba the Hutt holding his smoking pipe in one hand. 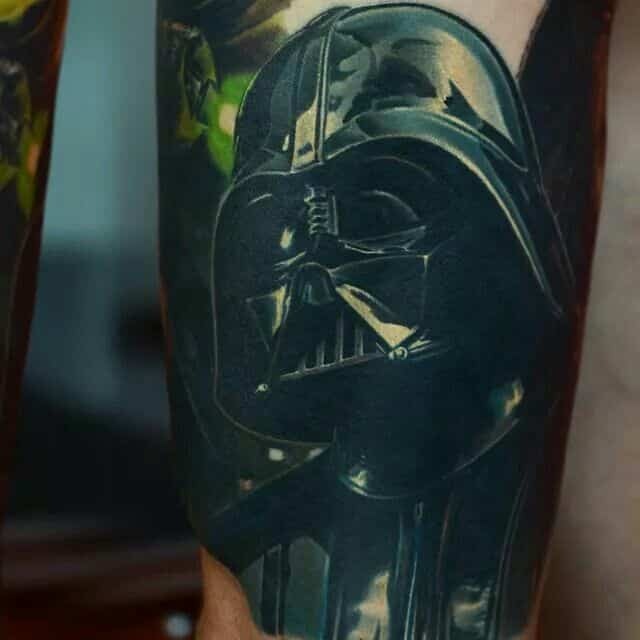 This is one of the best Star Wars tattoos for men and features Darth Vader, arms crossed and looking mean, with a feisty Yoda in front with his arms crossed in his robes. 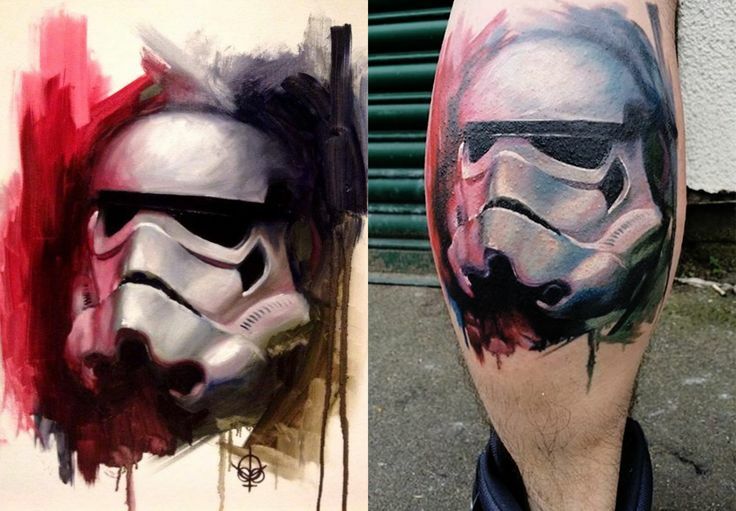 On the left is a Stormtrooper and one the right, General Grevious. 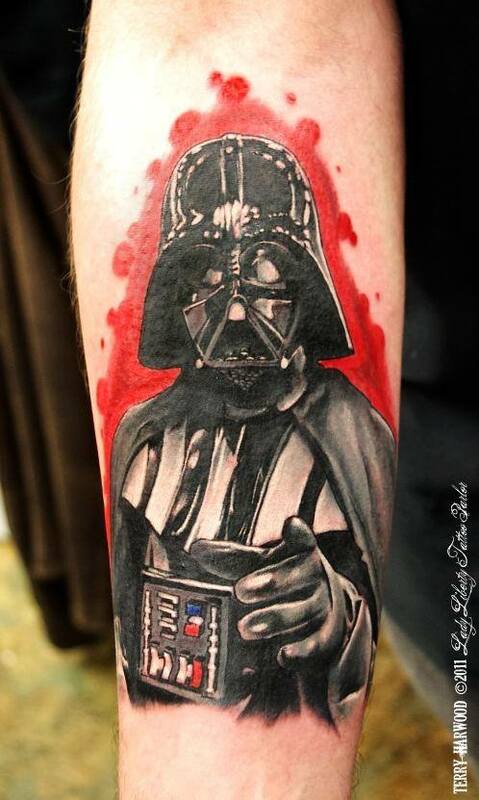 This Star Wars tattoo design has Hans Solo ready for action, pointing the gun out at you. On the other side, Darth Vader looks down menacingly. In front of Vader are a team of Imperial Royal Guard in their red robes. All the main Star wars characters – Luke Skywalker, Hans Solo, Princess Leia, Bobba Fett, Chewbacca, Obi-Wan, Darth Sidious, Darth Vader, an Imperial Royal Guard and R2D2 behind crossed red and green light sabers, with the Rebel Alliance logo on the right and the Imperial Forces logo on the left. 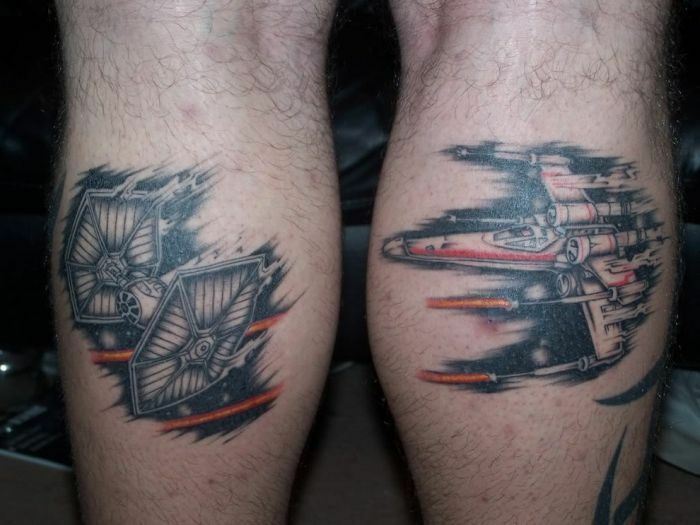 Split into two, this Star Wars tattoo features a fleeing TIE/LN starfighter avoiding laser fire on one side. On the other half is the X-Wing which is pursuing close behind with all laser cannons firing. 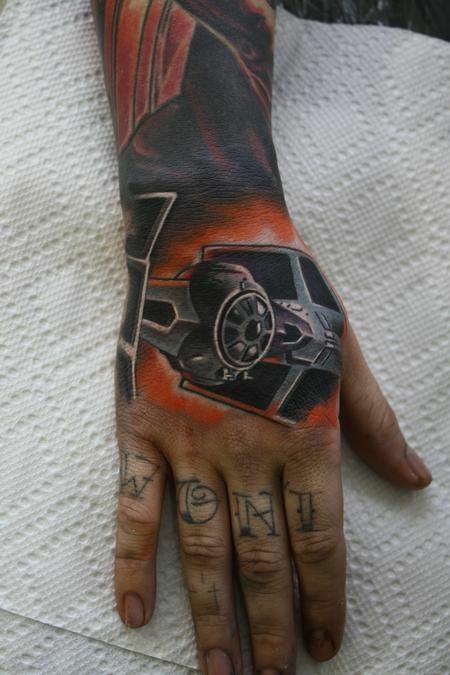 A Star Wars tattoo design for both arms, on one is Hans Solo, with gun pointing, ready to shoot. 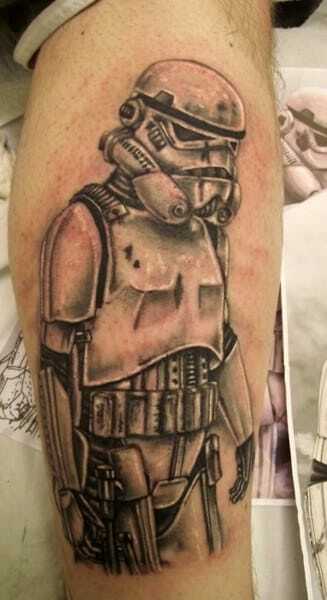 On the other arms is a Stormtrooper, also with weapon drawn. Behind both characters are planets and space ships from the films. 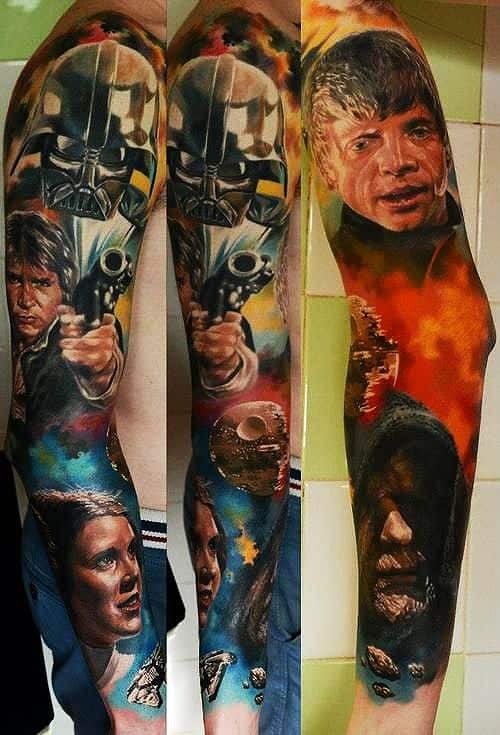 These Star wars tattoos go on one arm each, both in color. One is R2D2in his blue and white. The other is C3PO in gold, but with his helmet removed and held in his hands in front, revealing a man inside. A giant AT-AT Walker of the ImperialForce from the famous battle on the snow planet of Hoth is depicted inside a logo of the Rebel Alliance. Beside it is a land support vehicle train and in the air, an attack craft. 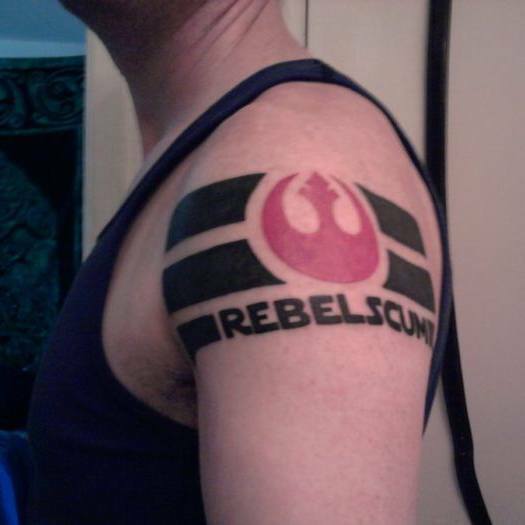 A tattoo of the Rebel Alliance logo as a flag. The logo itself is in the center and is red in color. On either side are two thick horizontal stripes with a thin empty space between them. Under this flag is the word ‘REBEL SCUM’, also between two thick stripes. A simple logo of the Imperial Forces for the shoulder done in metallic white that makes it look like the door to a bank vault. The entire logo is in 3-D, with shadows falling from the different components. A TIE/LN starfighter of the Imperial Forces is shown zooming past with the orange fireball of an explosion behind one wing. Behind the fireball is the blackness of space.The detail shows the light reflections off the glass panels of the fighter. 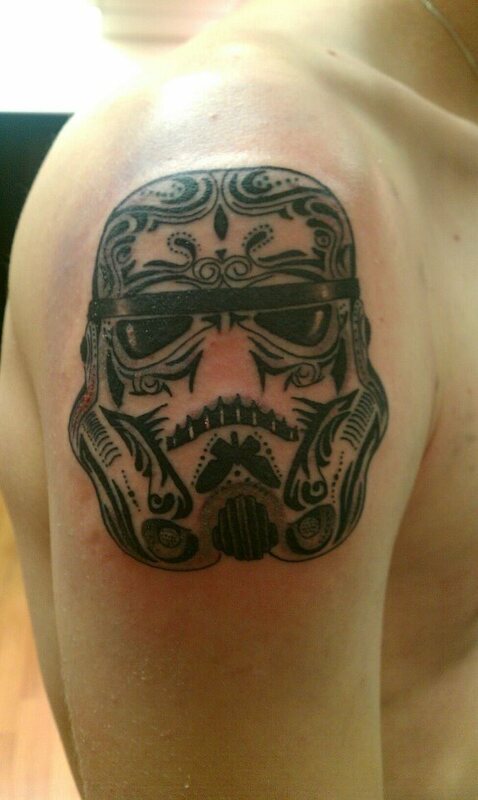 This tattoo features the helmet of a Stortrooper seen from the front. It is covered with designs similar to what traditional Maori warriors have tattooed on their faces all over the front and continuing to the top of the helmet. Bobba Fett’s green helmet with red visor and yellow antenna lead shown from the side. Above it are the words ‘EXISTENCE IS’ following the slope of the front of the helmet. Under the helmet is a scroll with the word ‘PUNISHMENT’ on it. 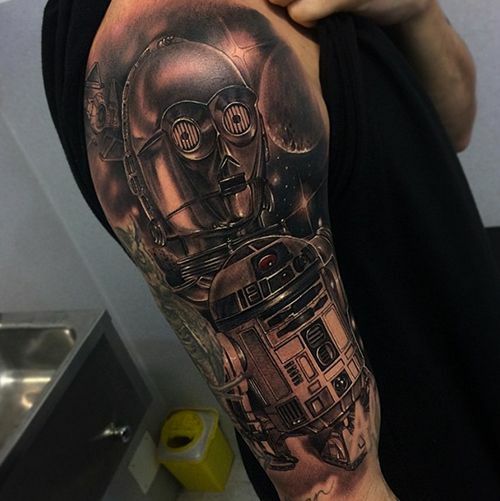 This Star Wars tattoo features te iconic scene from the film where Luke Skywalker is flying off in his Rebel Alliance X-Wing as the Death Star explodes in the background. The logo of the Rebel Alliance is superimposed on the Death Star. This design is for the top of the shoulders. On one side is the handle and lower blade of a red light saber and on the other, the top end, making it look like it has gone through the body. 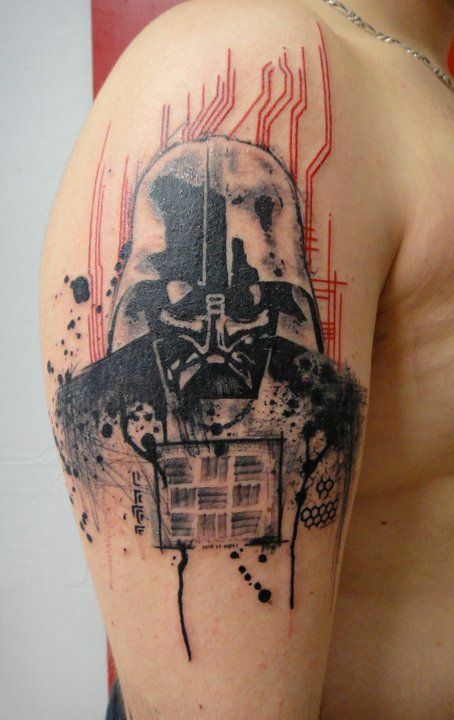 One of the most eye-catching Star Wars tattoo ideas. 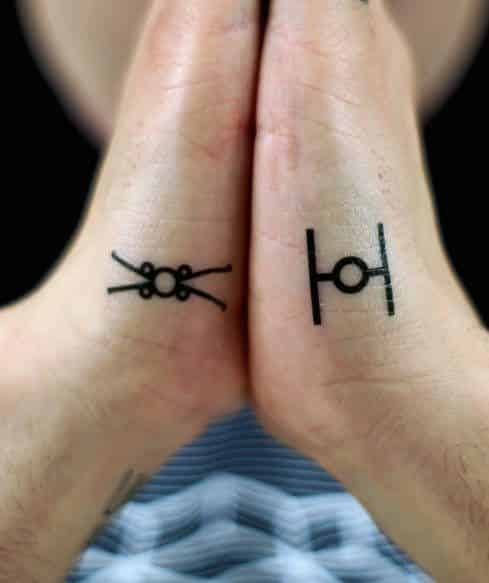 A very simple line drawing tattoo of the two main air fighters featured in the Star Wars films – 4 straight lines and 1 circle makeup the TIE/LN fighter and 4 straight lines and 5 circles make up the X-Wing. 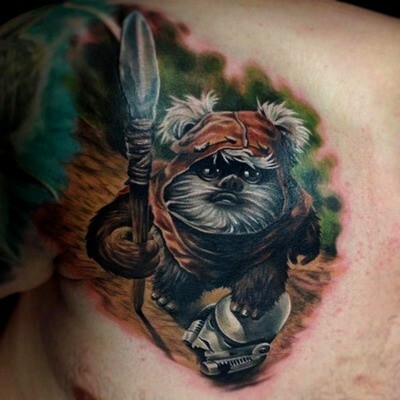 A full color tattoo of a furrylittle Ewok from the planet Endor with a spear in his hand that is a piece of sharp stone tied to a long, straight piece of wood. The Ewok has one foot on top of a Stormtrooper helmet lying on the ground. Darth Vader’s helmet is shown from below with a TIE/LN fighter flying out of it in front of the Death Star and a background of stars in space. Below them, two big red flowers with green leaves attached. 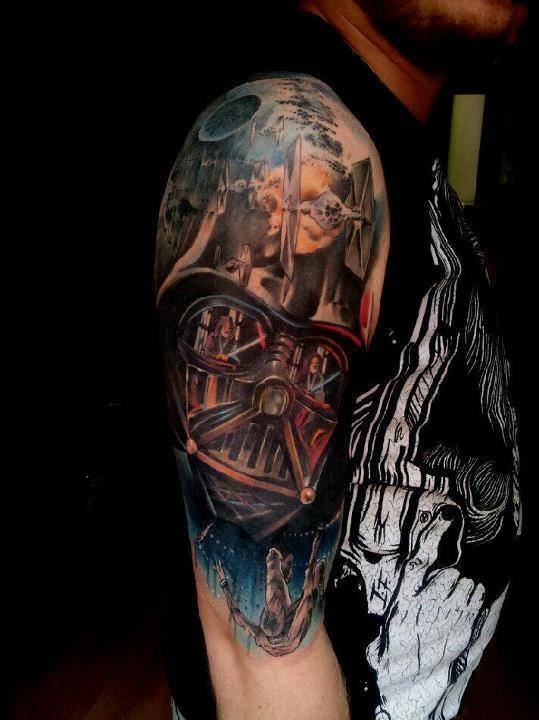 A very detailed tattoo featuring Darth Vader looking down upon a scene. Beside him is Luke Sywalker, his face in shock. Below them, Hans Solo has drawn his gun and is pointing it. 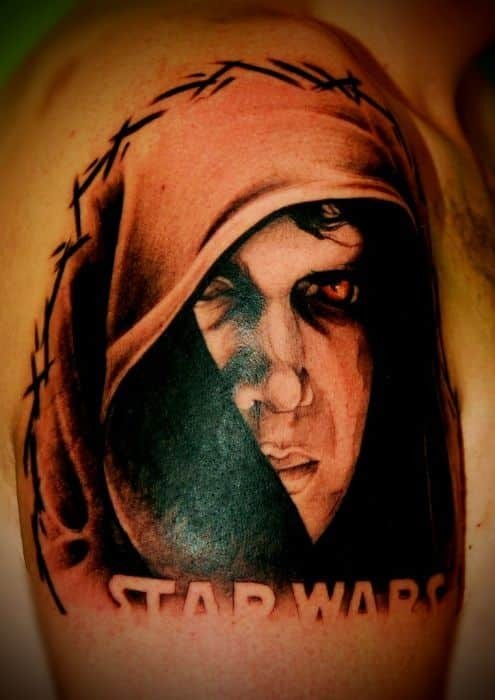 Under him is Princess Leia on one side and Darth Sidious on the other. 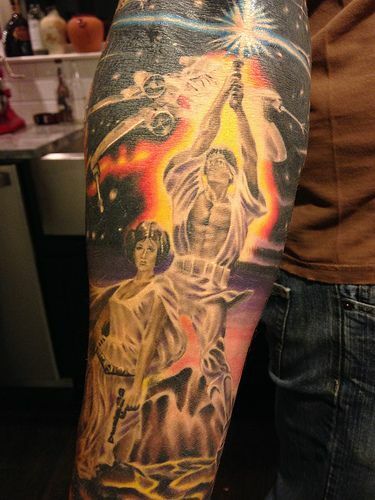 Slightly similar to the ‘Army of Darkness’ cover, this tattoo has Luke Skywalker brandishing his light saber above his head as Princess Leia stands behind him and a Rebel Alliance X-Wing flies overhead. The light saber and Luke’s entire torso are highlighted by a yellow halo behind them. A collection of the helmets of three Star Wars villains. 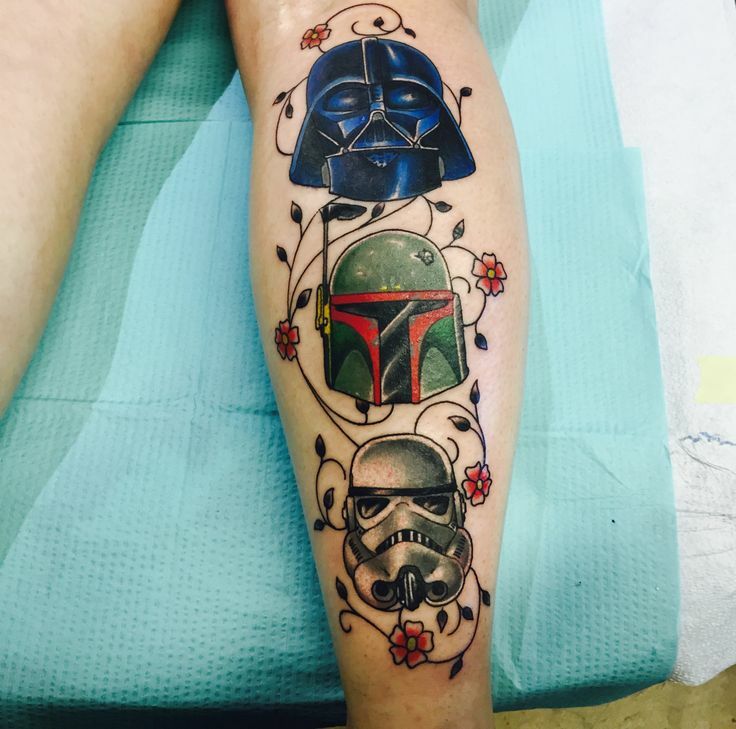 On top is Dath Vaders’ black helmet, below him is Bobba Fett’s green and red one and on the bottom, a Stormtrooper’s in white, all surrounded by a vine and red flowers. A Stormtrooper of Darth Vader’s 501st Legion with blue stripes on his helmet and armour stands with his weapon drawn in front of a large logo of the Imperial Forces. Inside the logo is the orange-yellow fireball of an explosion. A scary close –up of Anakin Skywalker’s pale and haggard face, complete with red eyes as he turns to the Dark Side. His face is shown almost hidden in the cowl of his brown robe.